Gr1 winner Brazen Beau was sold by Murrulla Stud, and it is the combination of the farm’s perfect land, experienced owners, and commitment to quality that led to such a fantastic result. Located in the Hunter Valley, Murrulla Stud is the ideal location for broodmare owners who want their horse boarded on a select property near all the major stallion farms. Run by Tim and Celie Nolan, Murrulla Stud presented their first draft under the current ownership at the 2009 Inglis Classic Yearling Sale, where they received the award for the best presented draft. That draft produced nine individual winners. With this quality start behind them, Murrulla continues to grow from strength to strength, with the horse at the heart of their operation. Murrulla Stud caters for short term and long term spelling and broodmare agistment, with walk on services to all the Hunter Valley studs. 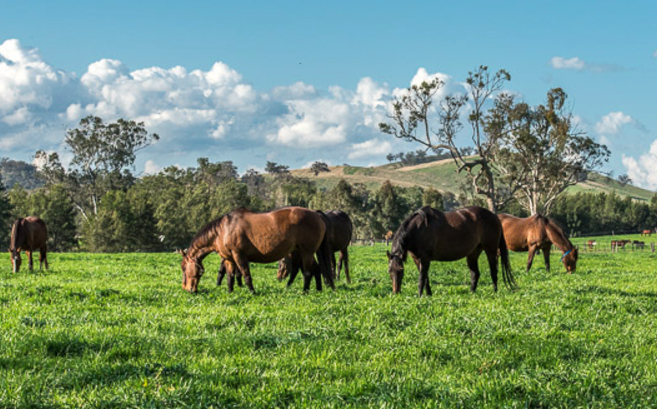 From assistance with mating advice, through to walk ons, foaling down, weaning, and taking your yearling through a full sales preparation; Murrulla Stud offer the full range of services for broodmare owners. The farm has a vet on 24hour call, and they also utilise an expert blacksmith to ensure every foal has the best opportunity to grow correct, sound legs that give them the greatest chance to win races. Tim Nolan grew up on Raheen Stud in Queensland, and has acquired plenty of experience in the industry before branching out to his own property. Celie Nolan is a qualified veterinary nurse, who previously worked at Vinery Stud in Scone. With graduates like Gr1 winner and sire Brazen Beau, Gr2 winner Perana, Gr3 winner Triple Elegance, stakes winner Dubleanny and recent dual stakes winner Torvill, together with a host of stakes placed horses and city winners; clients can send a horse for a sales preparation at this property knowing that Murrulla Stud is a source of top class race horses. The farm consists of beautifully fenced paddocks, and Kingdon Ponds – a major tributary of the Hunter River – runs underneath the pastures at Murrulla Stud. This contributes to lush, rolling paddocks that obviously are capable of producing Gr1 performers. Tim and Celie Nolan treat every horse as their own, and are very hands-on farmers. Every horse receives careful individual handling at all stages of their life, and this ensures that they arrive at the yearling sales ready to go into their future career. Murrulla Stud also stand two stallions – Gr1 racehorse and sire Charge Forward, and Office Bearer, who is a brilliant Listed winning sprinter by Officer (USA) from a Street Cry mare. Murrulla Stud knows the Thoroughbred industry, and as their first priority is to their clients, this farm is ideally placed for broodmare owners who wish to have their horse on a Gr1 producing farm.